last week we had to make a treat to bring into work for our co-worker's birthday. instead of making cupcakes or cookies, we decided to make muffins. 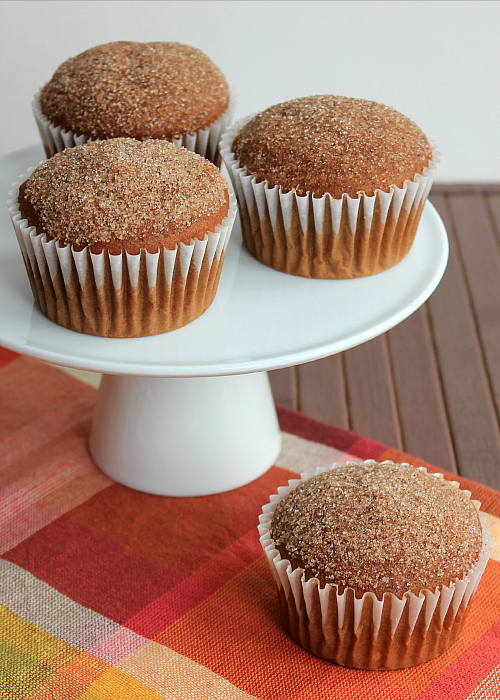 as soon as i found the recipe for these gingerbread muffins i just knew that i had to make them. 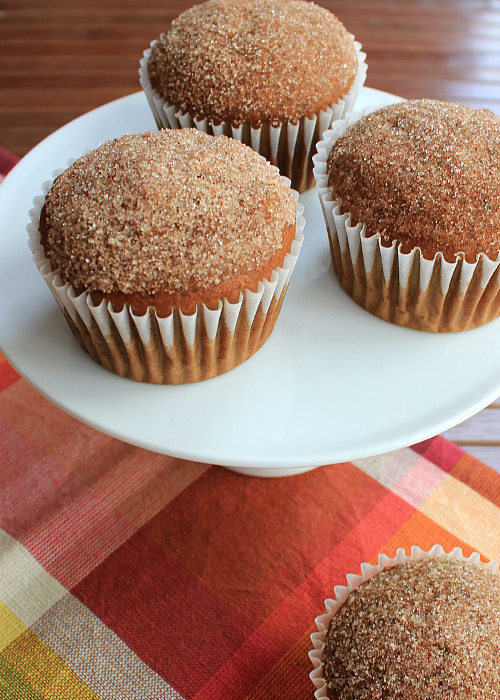 these muffins have the perfect texture. they are soft and moist. the combination of the spices and the molasses give them such a great flavor too. it was like taking a bite right into the holiday season. 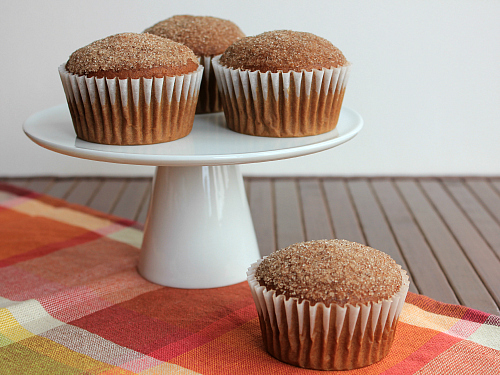 the cinnamon-sugar topping on these muffins reminds me of cinnamon-sugar doughnuts. thus, the name gingerbread doughnut muffins. 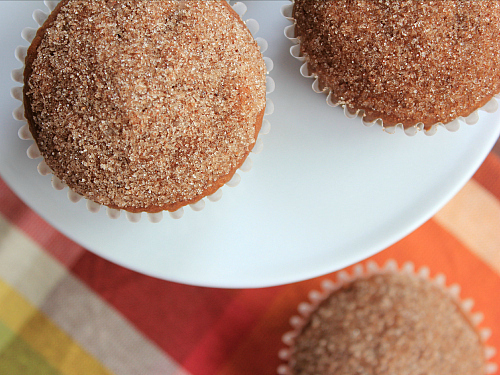 these muffins are a great seasonal treat. they were a huge hit at work, and they were the perfect companion to a cup of coffee. we absolutely loved them and we can't wait to make them again! preheat your oven to 350 degrees F. line two muffin pans with paper liners. in the bowl of an electric mixer, cream the butter and sugar together until light and fluffy (about 2-3 minutes). add the eggs, one at a time, mixing well after each addition. mix in the molasses. in a separate bowl, sift together the flour, baking soda, and spices. mix in half of the dry ingredients, just until incorporated. add the second half of the dry ingredients and mix just until incorporated. with the mixer on low speed, gradually add the water. beat well until no lumps remain. spoon the batter into the prepared muffin pans, approximately 3-4 tablespoons of batter for each muffin. bake for 16-18 minutes, or until a toothpick inserted into the center of the muffins comes out clean. allow the muffins to cool in the pans for 10 minutes before removing them from the pans and transferring them to a wire rack to finish cooling. after the muffins have cooled completely, whisk together the sugar and cinnamon in a small bowl. one at a time, brush the top of each muffin with melted butter, then dip the muffins into the cinnamon-sugar mixture to coat the tops of each muffin evenly with a thin layer of the mixture. We made a ginger bread house the other day. It smelled so good while it was baking, but aren't eating it just yet. These muffins look delicious! These look really good. Do they have the texture of gingerbread cake?